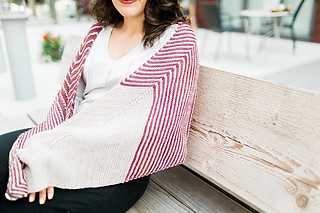 The perfect layering accessory, this slightly asymmetrical triangular shawl features hints of lace that pops against a background of garter stitch. Worked sideways and with a delightful interplay of colour patterning, it’s a fun project that suits every level of knitter. 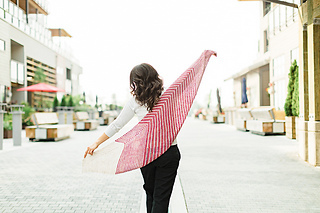 This shawl is worked in one piece, from side to side. You’ll begin at one single point and increase gradually to the desired width, then decrease back to a single point. To maximize the full use of your yarn, work the 8-row repeat of the Eyelet Increase Section until half of your yarn remains, then move on to the Eyelet Decrease Section and work the same number of repeats as the Eyelet Increase Section. 2 skeins SweetGeorgia Yarns Tough Love Sock, one each in Linen (MC) and Strawberry Tea (CC) (437 yd / 389 m; 80% Superwash Merino, 20% Nylon). 26 sts and 34 rows = 4” / 10 cm in Striped Garter Stitch, blocked firmly.